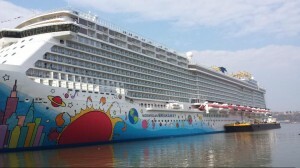 This spring break Aidan and I were able to go on a 7 day cruise on the Norwegian Cruise Line’s best ship, The Breakaway (voted best new ship). The Cruise stopped in Cape Canaveral, Florida, Great Stirrup Cay, Bahamas, and Nassau, Bahamas. Aidan refers to this as our “first real holiday together” and he was mostly right. Last spring break we spent four days in Boston, which was pretty cool, but nothing compared to the cruise!